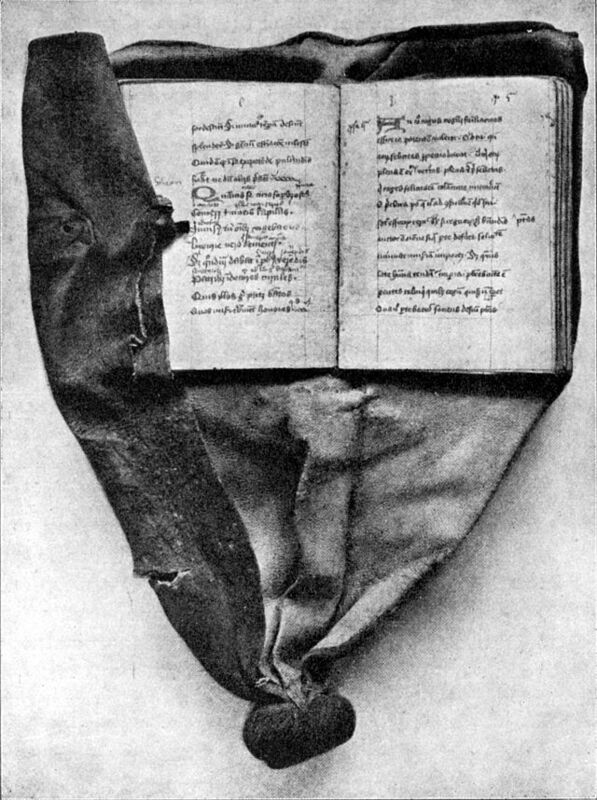 A girdle book; image from Wikipedia. Recently a colleague of mine cataloged a “girdle book” for our library. I’d never seen one before. It is a small book, typically a prayer/liturgy book, that is bound with long tail of soft leather and clasp so that it can be attached to one’s belt (“girdle”) for easy access. Our specimen is a 17th century German prayer-book, I think Lutheran, and had been rebound in the 1980s. It is a small, but thick, manuscript, and it looks to me like the original clasps were saved in the rebinding but the tail was placed on the top edge rather than the bottom edge, so that it hangs upright. I think it would be more handy to have such a book hand upside down, so that when you pull it up the tail is on the bottom. 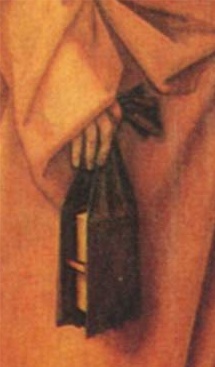 This fellow is carrying the girdle in his hand, but normally you’d attached the knotted “tail” to your belt. Image from Wikipedia. Girdle books seem like pretty natural fits for adventurers. IIRC the first edition Unearthed Arcana described “traveling” spellbooks, which would be compact spellbooks that a magic-user took on an expedition. These would be lighter than a standard spellbook and have fewer spells, but the benefit is that you would not be as burdened and losing it to dragon fire or whatever hazard you faced would be less of a crippling blow. If you Google Image Search the term, you’ll see a lot more examples. 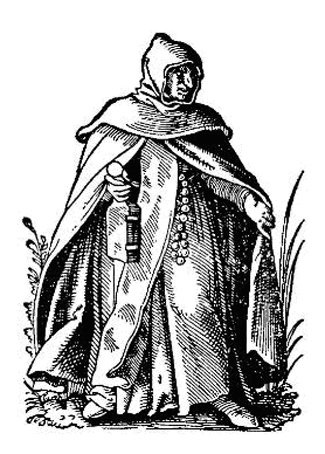 Some have a pair of rings attached to the cover and loop a chain through them; I kind like the image of a mage with a tiny spellbook on a chain, like the dudes you sometimes see today with their wallets on a chain. Very cool! That’s for the info. I love things like this. I’d never heard of these. Very cool. So here is the travelling magic books of magic users..and clerics..we use these in our Classic Fantasy campaign..
Yeah, I had clerics use spellbooks (er, prayerbooks) in my last D&D campaign. This is wonderful stuff, I can see Priests of a particular God in my setting using these to record their visions. Thanks!